Like all kids, I loved to watch construction. And like most people, I can't even began to understand the process. I still call the vehicles that I see on construction sites "Tonka Toys". I slow down for construction workers (and not just because fines double in construction zones, although that may be only in California, I don't remember?). Luckily, I have spent most of my adult life in Phoenix, which has always had construction. I have a special interest in freeway construction, which, although it puzzles most people that I care about it, is some of the most amazing architecture and construction that I've ever seen. And I someones wonder if there are other people out there who feel the same way that I do? I live in the west valley and nowadays the construction of the 303 freeway is at its most amazing. Yeah, in a few years people will just take it all for granted, or complain about it, because that's what we all do with roads and freeways. Somehow most of us just imagine that they just suddenly appear, like magic. 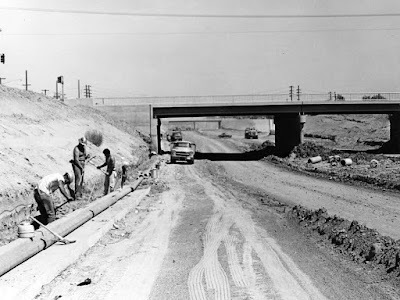 I'm interested in the history of Phoenix, and I collect old photos and post them on a Facebook page, and that makes looking at the roads, bridges, and freeways of the Phoenix area all that more amazing. Sometimes I'll just go take a look at a chunk of empty land and wonder how in the world they figured out where to build the road, how to build the bridge, and how something as gigantic as a stack on a freeway interchange could be designed. But there they are! And it gets even better, and more complex. It's not enough nowadays to build freeways that work, they have to look great. There are graphics on them, and of course, landscaping around them. Sure, we take them for granted after they're built, that's what we're supposed to do. But the people who design them, and build them, deserve more respect than that. At the very least you could slow down. And may I recommend that you take a look at construction? You knew how to do when you were a kid! Image above: construction the Black Canyon Freeway (I-17) in 1961. The fines are double here, too. Thanks, Michael! I got so used to slowing down for construction in California that when I do in Arizona, it seems to feel strange as the cars fly around me. I guess they don't enforce the law in Arizona? I worked as a surveyor laying out this type of construction for more than 50 years. It is kind of like a disease, that you enjoy being hot or cold, but mostly dirty because you are playing in the dirt! Sort of a giant sand box for big kids. It is pretty amazing going from raw ground to the finished project. Drive the Sonoran Boulevard from Cave Creek to the freeway to see a very beautiful project that was built through mostly gorgeous land. Also, worked on SR51 from McDowell to Glendale. It started out as just going to be a 4 lane road with stop lights at every mile. I believe the speed limit was to be 40. It quickly transformed to a freeway which probably would not be built now, but it was started in the 80's. People do not appreciate the work that everyone puts into these projects. A great deal of problem solving goes into these roads that people take for granted. Thank you so much for taking the time to write this comment! And thank you for building the stuff that we all take for granted!